On August 21, 2013, Sean Boushie signed a sworn affidavit before a notary, and he swore that he was in danger of harm from Bill Windsor. The false sworn affidavit was used to get William M. Windsor arrested and jailed for 134 days. “I am in danger of harm." 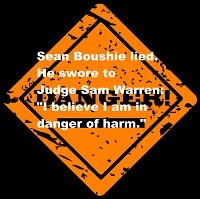 You are here: Home News Cyberstalking Sean Boushie Criminal Charges against Sean Boushie: False Swearing, Perjury, False Police Report: "I am in danger of harm from Bill Windsor"